"Recalling childhood adventures exploring the surrounding lakes and forest, the clients wished to share this unique place with others by creating a place of reprieve to be rented to vacationing families," said the team. Tucked into a hillside, the two-storey holiday home is composed of rectilinear volumes wrapped in black fibre-cement panels, stained cedar and glass. 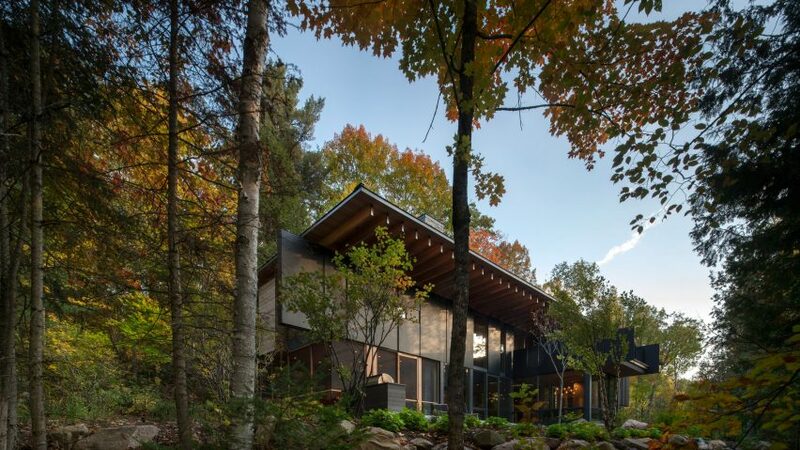 The cabin's rhythmic facade is intended to "mimic the lines of the forest". Exposed, glue-laminated Douglas fir beams support a vast roof that extends far beyond the exterior walls. "The two levels are connected by a glazed stair volume adjacent to the hillside and anchored by a monolithic fireplace clad in locally sourced granite," the team said. Interior finishes include wire-brushed walnut flooring, handcrafted tiles and windows lined with fir. Benches and bar tops were fabricated using wood reclaimed from a nearby barn. "This rich palette of materials lends a tactile softness to the building that blends seamlessly with the natural environment," said the team. The property offers canoe docks and boardwalks, along with a private network of trails that were created by the client. "Vehicular access ends at the property, which backs onto government Crown Lands, creating a truly remote sensory experience," the team said.